An automated cell counter has never been this easy or affordable. Fully automated cell counting and cell viability analysis. Autofocus technology for fast and reliable cell counting. Trypan blue stained cell counting or non-stained cell counting methods. Various histograms and cell-size gating. Unmatched counting accuracy and speed. The most affordable running cost currently on the market. Don't spend more money and waste time on slides that require you to peel off a protective film! The Luna-II automated cell counter is the most advanced cell counter with unmatched speed, accuracy, and consistency of measurement. It is a stand-alone instrument integrating precision microscopy optics, an onboard PC, image analysis software, automatic focusing, and an optional built-in printer. 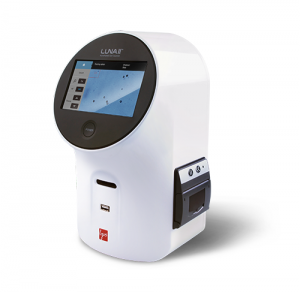 The Luna-II accurately detects total/live/dead cells at concentrations ranging from 5x10-4 cells/ml to 1x10-7 cells/ml and cell sizes between 3um and 60um. The LUNA-II™ automated cell counting algorithm has been recognized to have the best-in-class cell counting accuracy. The LUNA™ software has exceptional accuracy in cell de-clustering and can successfully count clumpy cells. The LUNA-II™ automated cell counter has inherited this well-known performance aspect of the LUNA™ software. Clumpy cells are de-clustered quickly and automatically, then counted as individual cells. Automated cell counters utilize disposable counting slides to eliminate washing steps of manual cell counting with the glass hemocytometer. Although disposable cell counting slides have several advantages, the increased running cost has been a substantial concern. Logos Biosystems developed a patented T-BOND technology to manufacture precision cell counting slides more efficiently. Therefore, the unit price of counting slides became much more affordable, providing significant cost savings. A thermal printer is integrated in the LUNA-II™ automated cell counter, and the counting results can be printed immediately for record keeping purposes. Because the printer is already integrated in the LUNA-II™ automated cell counter, an additional cable connection is not required. Counted cells can be sorted with cell cluster map, into single cells, doublets, or triplets. The cell cluster map can be used to monitor changes in culture conditions or cell isolation/preparation protocols. The LUNA-II™ automated cell counter provides a powerful review option. A separate PC unnecessary. Users can open cell images directly on the LUNA-II™ automated cell counter to check previous results.